Note: Don’t try to study the diagram above without clicking for a higher resolution version. Your eyes will thank you later. Update (12/08/10): Download the PDF version and distribute it as far as you can. Although somehow I can’t see it ever competing for student dorm wall space with the likes of Tony Montana, ‘Tennis Girl’, and the cast of ‘Cheers’. Um, are there prints of this available? Not as yet. If there’s a demand for it I’d be tempted. This is beautiful – succinct, integrative, and thoughtful. I would propose that a fourth quadrant could be added to the bottom left – called leadership and communication. Every effective content strategist is also a leader, communicator and consultant – it would fit well with the user analysis, strategy element, and would add the negotiation and leadership roles that both draw content strategists to the field, and serve them so well once they are there. Not necessarily a print, but printable would be nice. This is excellent! If a PDF version is ever available I’d love to get the file. I’ll be sending this to to the team. Nice work! @Jennifer – Excellent. I do believe you’ve found the missing piece! With a few tweaks it would certainly plug nicely into the diagram. @Elaine and @Chris Dizon – Expect a PDF version tomorrow. The pdf is coming tomorrow….why it’s akin to awaiting the release of the latest, greatest CD! Richard, congrats on an amazingly accurately and useful graphic. I like @Jennifer’s comments and will be interested in seeing if/how your piece evolves. Do I see a spelling error? “mesage map” vs. “message map”? @Jeffrey – Indeed you do, thanks. Although I’m slightly disappointed the typo gods didn’t throw up something more interesting like ‘massage map’. 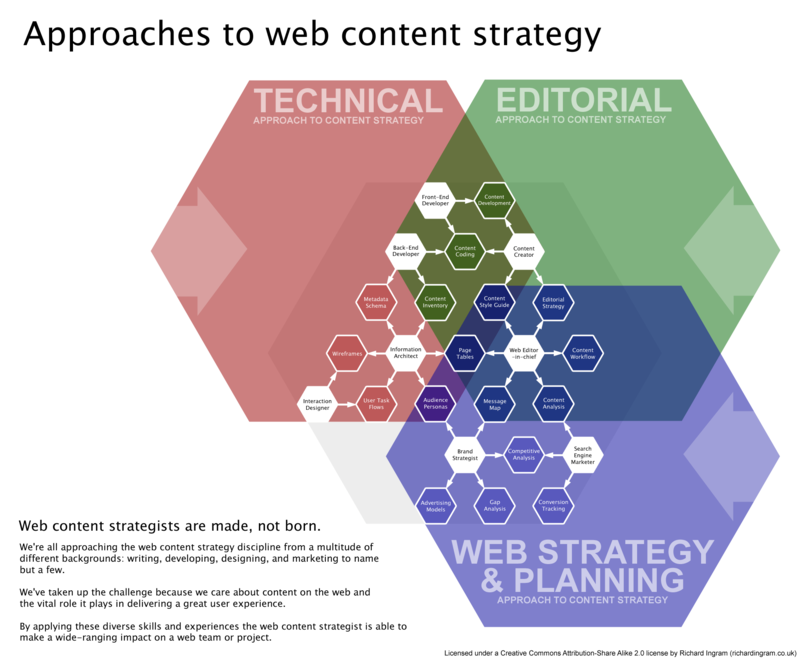 I would think that the lower, right-hand, purple hexagon should be “Corporate Content Strategy” because it applies to far more than just web content.